Another Beautiful Day in Paradise. We had a great turn out today. Absentees Janice, Inessa, Deb B, Dave, Nancy, Deb D, Vivian, Pete K, Denise and Laura came. Welcome all. We were having a Surprise Birthday Brunch for Suzanne B which helped. We decided to do Snell Island and go by Kim & Joels and wake them up. They came out to greet us smiling. After Kim & Joel's we decided to break up into a group that would go back and one that would cover some more ground. Jeff took the one group back which ended up doing about 10 miles and John L led the other group who ended up doing around 14 miles. We had 7 bladers and 12 bicyclers. We had the Suzanne B Surprise Birthday Brunch as planned at Fergs. We passed around a big Happy Birthday Card that Sam had provided. Hopefully most everyone got to sign it. 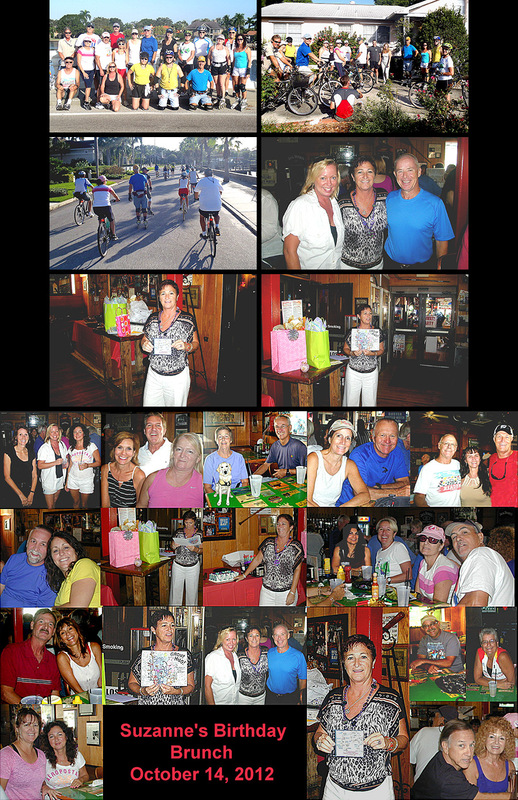 A big group were gathered at Ferg's when Suzanne arrived. She did look surprised when she walked in. Fergs had a 10 rated Brunch prepared for all and we had a grand time devouring it. After Brunch Suzanne looked at her cards and opened presents. Naturally we sang Happy Birthday to her. Thanks Jim and Suzanne for a wonderful time.